The Differential Association is delighted to announce that our next book club meeting will be an author event, with Professor Ian O'Donnell of University College Dublin. 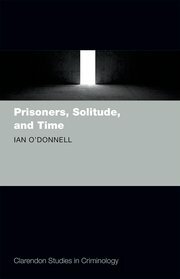 Professor O'Donnell will be talking about his new book, Prisoners, Solitude, and Time, which will be followed by a general group discussion of the themes and ideas in the work. For a description of the book, see below, the first chapter is also available from the above link. The event will be followed by a small wine reception. While the deleterious effects of penal isolation are well known, little systematic attention has been given to the factors associated with surviving, and even triumphing over, prolonged exposure to solitary confinement. Through a re-examination of the roles of silence and separation in penal policy, and by contrasting the prisoner experience with that of individuals who have sought out institutional solitariness (for example as members of certain religious orders), and others who have found themselves held in solitary confinement although they committed no crime (such as hostages and some political prisoners), Prisoners, Solitude, and Time seeks to assess the impact of long-term isolation and the rationality of such treatment. In doing so, it aims to stimulate interest in a somewhat neglected aspect of the prisoner's psychological world. The book focuses on an aspect of the prison experience - time, its meanderings, measures, and meanings - that is seldom considered by academic commentators. Building upon prisoner narratives, academic critiques, official publications, personal communications, field visits, administrative statistics, reports of campaigning bodies, and other data, it presents a new framework for understanding the prison experience. The author concludes with a series of reflections on hope, the search for meaning, posttraumatic growth, and the art of living.